Since 1898, Clark Grave Vault has manufactured a complete line of the highest quality metal burial vaults in the world. Today’s product line consists of burial vaults, urn vaults, and grave liners. Clark Grave Vault currently manufactures products in a variety of materials and finishes including steel, galvanized steel, stainless steel and solid copper. 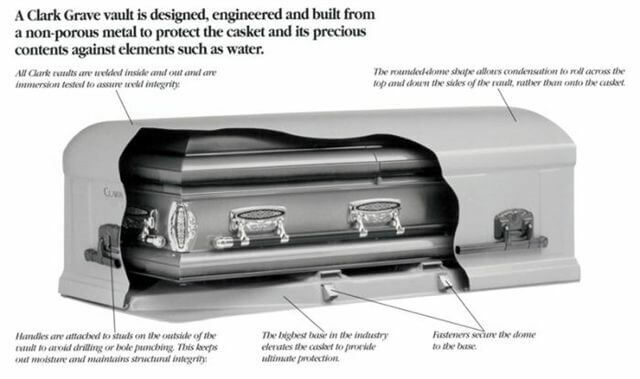 Every Clark vault is guaranteed to protect the casket from water and other elements through the use of an air seal principle. This can be easily demonstrated by turning a glass upside down and then submerging the glass into water. The air trapped inside the glass prevents the water from rising more than a fraction of an inch. The same is true of a non-porous Clark metal vault. The air trapped inside the dome prevents outside water from reaching the casket. Solid Copper offers the finest protection. Accented by brushed side panels, ends, and an attractive band around the top. A premium grade alloy with high chromium and nickel content as well as iron and carbon. Features brushed panels and bands on sides and ends. Four pounds of stainless steel per square foot. Available in 4 color finishes. Constructed of Series 5052 aluminum. Clark’s all-aluminum construction preserves the vaults integrity, while the dome-shaped design channels water away from the casket. Galvanizing process adds a zinc coating that more than doubles the life of the steel. Available in 4 color finishes. Galvanized Steel 10 Gauge (not shown) – available in 4 color finishes. Galvanized Steel 7 Gauge (not shown) – available in 3 color finishes. Long lasting protection at a lower price.